Carrots grow far better in containers and raised beds compared to those grown the open soil. Containers have crumbly compost which is the ideal growing medium for carrots. You also have total control over watering and weeding. The final benefit of growing them in containers and raised beds is that they can be crammed in with no effect on cropping. The smallest container which carrots can be grown in is really only determined by the depth of the container. 20cm / 8in deep is about the shallowest container suitable for carrots. The actual diameter of the container only affects how many carrots can be grown in the container. Plastic, clay, round, square or oblong containers are all ideal, they make no difference whatsoever to how your carrots grow. And of course carrots can be grown in exactly the same way in raised beds. The soil requirements for carrots in a container or raised bed is a light soil which retains moisture. This is similar to many other vegetables and we describe how to set up your raised bed with soil here. Start sowing early variety carrot seeds during the first to second weeks of April. Start sowing maincrop carrot seeds during the first to second weeks of May. Sowing carrots in containers and raised beds is easy. Draw a line in the soil with a plant marker to form a shallow groove about 2cm (just under an inch) deep. Pour a small amount of seed into the crease in the palm of your hand. Then tap your hand whilst it is gently sloping down. In this way a small amount of seed will be sown. Cover the seeds lightly with the surrounding soil and gently water them. If you are sowing more than one row then space the rows about 7cm / 3in apart. 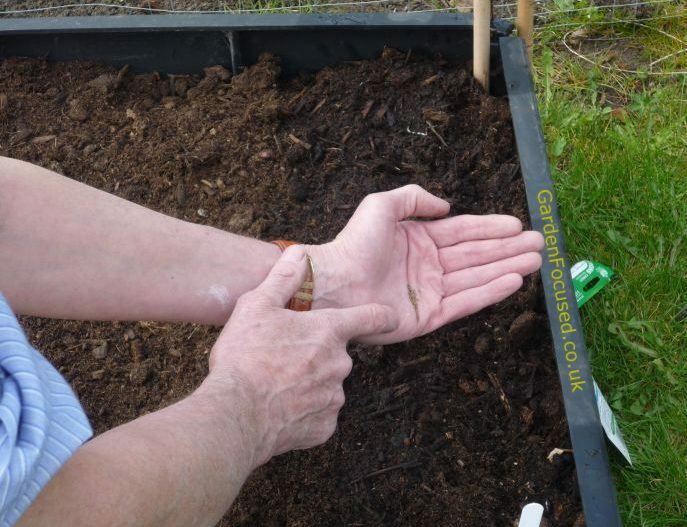 Another way of sowing carrots is to simply sprinkle them in a line on the soil as described above and then cover with thin layer of multi-purpose compost or horticultural vermiculite. Water gently over the surface. The reason we try and limit the number of seed sown is to reduce the later need for thinning the seedlings out. With such fine seed it's easy to sow far too many increasing the time it takes to thin out the seed. Below is our amateur video showing how we sow carrots in a raised bed. Because carrots can tolerate shade and are small plants, they are ideal candidates for inter-cropping (growing in between other plants). Our video also shows us sowing seed in a container that already has raspberry plants in it. Carrots will do fine if you follow the care instructions we give for raised beds (the same applies to container grown carrots) which can be found here. Our weekly calendar will also show what's to be done this week in the container and raised bed garden. Water is the prime need though as far as carrots are concerned, especially if they are grown in small containers. They may even need watering twice a day if the weather is warm and they are in the sunshine. With containers, it may be best to move your carrots into a shady position if a long warm spell is predicted. Feed once a week with a general purpose fertilise, tomato fertiliser is even better because it will encourage better root growth. 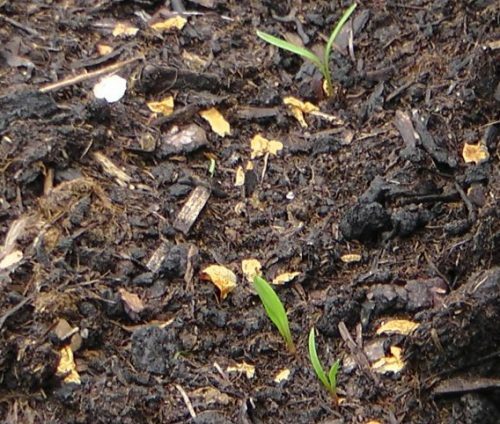 When the carrot seedlings emerge, about ten days after sowing, thin them out in the evening (to avoid the attention of carrot fly) to about 3cm / 1in apart. No further thinning is required because when the carrots begin to get congested simply harvest them as young plants. It's difficult to recommend specific varieties of carrots because taste varies so much. However, a few words on the different types of carrots and their names will help you make a decision on which ones you want to grow. The first division of carrot types is between main crop carrots and early carrots. Early carrots, as the name implies mature early, they take around 12 weeks to mature. In general they are smaller and sweeter than maincrop varieties. The down side is that early carrots do not store nearly as well as maincrop carrots. Our choice of early variety carrots is below. Growing to only 10cm / 4in long this variety can be grown in almost all containers and raised beds. Crunchy and sweet, this variety is one of the earliest to mature and has an RHS Award of Garden Merit. Another F1 early variety with a particularly sweet flavour, very pleasant texture and appearance. RHS AGM in 1993 (reconfirmed in 2013). This variety is also good for containers, growing to about 12cm / 5 in long. For those with shallow soils, Parmex is an excellent round rooted variety growing to only 5cm / 2in deep. It does well when sowed at intervals and can be planted as a filler amoungst other larger vegetables. Also has an RHS Award of Garden Merit. An F1 early variety which has an RHS AGM in 2006 (reconfirmed in 2010). Tastes delicious with well-coloured and crsip carrots. Grows to 12cm / 4in long. If you want carrots which store well then select maincrop varieties but be aware they need a greater depth of soil compared to earlies. If you want quick maturing carrots then go for earlies. Next, are the various words which are commonly used to describe different carrot shapes and types. Nantes type carrots are earlies, medium width and length. They store reasonably well and cope with clay well. Amsterdam type carrots are small and slender and mature quickly. They do not store well but have a sweet taste, great for eating raw. Chantenay type carrots are favoured by chefs because of their tip top flavour. They are cone-shaped and medium sized. Autumn King type carrots are the ones to use if you want to store them over winter. The are definitely main crop and take a long time to mature. Their name might give the impression that they do well in colder climates but in fact they need a good 16 to 20 weeks of sun to mature and be ready for storage. Which variety are we growing this year? Early Nantes 5 because they taste good, mature quickly and can be sown in succession from March to mid July.